An archer who wears this arm guard will certainly give this skull something to grin about. 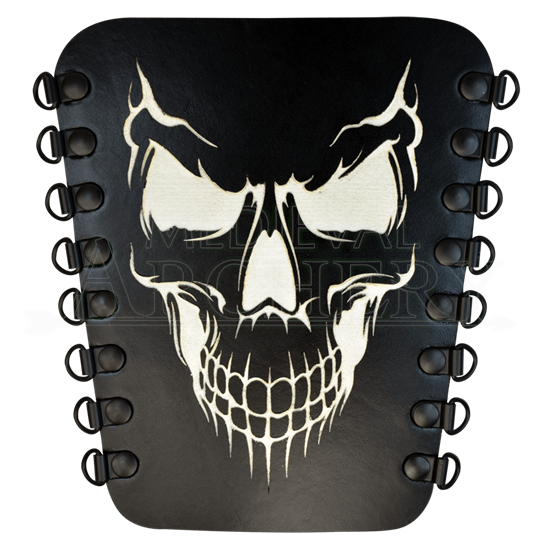 The Grinning Skull Archers Arm Guard combines the wicked and gothic look of a grinning skull with a hardy leather arm guard that works wonders in keeping your arm safe. Of course, this skull loves nothing more than to hear the snap of a bowstring, and nothing keeps that grin so wide as the sight of an arrow sinking deep into a target. Luckily, the skull is on an archers arm guard, so it gets to see a lot of archery. The bracer itself is crafted from 7/8 oz. leather, which makes it both supple and strong, as well as rather comfortable to wear. The skull design is etched into the bracer, and it is available in a few striking color combinations, which change not only the color of the bracer but also the hue of the skull, which leads to more than a few startling and stunning looks that this bracer can offer. The sides of the bracer feature speed lacers, which allow the bracer to be put on at speed, while still offering a good, comfortable fit. The bracer is sold individually and not as a pair. This archers arm guard is made right here in the USA and is exclusive to our shop. You can keep this Grinning Skull Archers Arm Guard happy and content just by slipping it on and putting a few arrows down-range at a target, although it will keep on grinning whether you fire your bow or wear it as a stunning accessory to complete your next assassin or archer costume. When selecting colors, the first color listed is for the color of the bracer. The second color listed is for the color of the skull.